One of the most challenging issues in the anticipation of risks in the business environment is to understand the dynamics of industry change and to recognize the relevant indicators. In large companies, different kinds of business and market intelligence systems and departments may collect great amounts of data and indicators related to the possible changes, but the difficulty lies in the interpretation of this data, and making sound decisions based on these indicators. It has been noted that the ability to anticipate where lucrative opportunities are likely to arise distinguishes top-performing firms from ordinary companies (Fine 1996). Marketing and technological forecasting capabilities are thus critical, especially for companies which are active in turbulent, high-technology markets. On the other side of the coin, risk and uncertainty are inherent in the hoped-for windows of opportunity, and forecasting ability is a critical capability in companies (Fine 1996). “Fortune favours the prepared firm” as Cohen and Levinthal (1994 p 1) have pointed out. 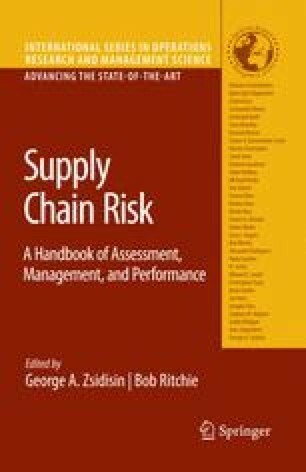 The primary contribution of this chapter is to illustrate different approaches to risk management in value networks. We present different theoretical backgrounds for analyzing networks and illustrate some examples of the analyses that can be applied to support risk management at the network level.